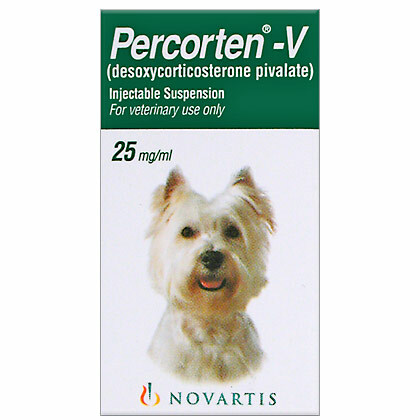 PERCORTEN-V (desoxycorticosterone pivalate) Injectable Suspension is the only medication approved by the FDA* for the treatment of Canine Addison's Disease (hypoadrenocorticism). Canine Addison's Disease is a condition where a dog's adrenal glands dont work properly. Normal adrenal glands produce mineralocorticoids that help regulate many bodily functions such as metabolism, blood pressure, and stress response. Percorten-V is a replacement therapy for the mineralocorticoid deficiency in dogs with Addisons disease. Possible Side Effects: May see irritation at injection site. If given at too low of a dose, may see signs of Addisons disease (weakness, depression, lack of appetite, vomiting, and diarrhea). If given at too high of a dose may see increased thirst and urination, and edema (swelling, fluid accumulation in the limbs). If you observe any of these signs in your pet, contact your veterinarian immediately. If your pet experiences an allergic reaction to the medication, signs may include facial swelling, hives, scratching, sudden onset of diarrhea, vomiting, shock, seizures, pale gums, cold limbs, or coma. If you observe any of these signs, contact your veterinarian immediately. Precautions: Not for use in animals hypersensitive (allergic) to it or drugs similar to it. Do not use in pregnant or lactating animals (female animals nursing their young). Do not use in patients with congestive heart failure, kidney disease, or edema (swelling). Do NOT give DOCP intravenously (IV, into the vein). Consult with your veterinarian regarding the physical examinations and laboratory testing necessary prior to and during treatment with DOCP. Drug, Food, and Test Interactions: Consult your veterinarian before using vitamins and supplements, diuretics, insulin, digitalis, amphotericin B or potassium-depleting diuretics like Furosemide (Lasix, Salix), since interactions may occur. Signs of Toxicity/Overdose: May see an increase in drinking and urinating, changes in heart rate or rhythm due to abnormal blood levels of electrolytes, or edema. Heart enlargement is possible with longterm overdosing. If you know or suspect your pet has had an overdose, or if you observe any of these signs in your pet, contact your veterinarian immediately. Keep this and all other medications out of the reach of children and pets. ** This information may not cover all possible uses, directions, side effects, precautions, allergic reactions, drug interactions, or withdrawal times. Always consult your own veterinarian for specific advice concerning the treatment of your pet.